This camera system can track very fast moving objects, keeping them in the centre of the screen at all times. Currently under development by the Ishikawa Oku Lab. at the University of Tokyo, this latest version captures Full HD video and can be used outdoors. This device consists of two mirrors for pan and tilt, and a group of lenses. The Saccade mirrors can be controlled at high speed, on the order of milliseconds. The mirrors move independently, so this system doesn’t lose its high-speed response even if it’s connected to a large, heavy camera. Also, by connecting a projector instead of a recording device, images can be projected onto a fast-moving object. 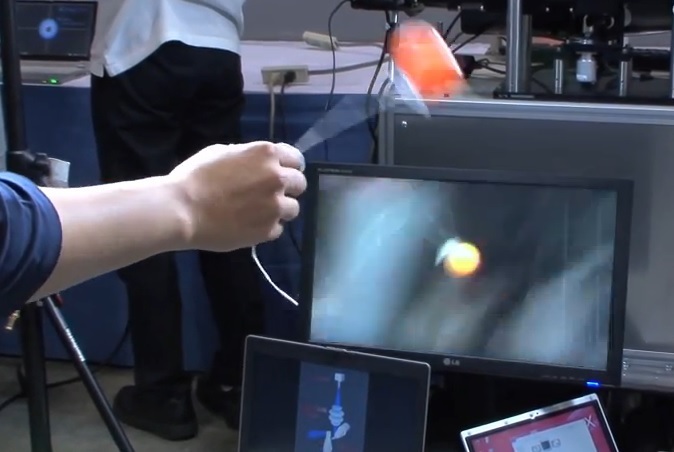 This could also be used in AR applications, showing interactive content on moving objects.